Eleanor Clift on the 15th anniversary of the Council of Women World Leaders. Whenever Mary Robinson, a human-rights activist and former president of Ireland, asks how many women people think have been elected president or prime minister, the answer she usually gets is five, or 11, or maybe 13—far fewer than the true number, which is 45. The Council of Women World Leaders marks its 15th anniversary this year, and there’s a long way to go before women reach parity with men at the highest levels of government. That’s all the more reason for women like Robinson, who have scaled those heights, to share what they’ve learned with the next generation. Robinson pointed out that women are the first to experience the negative effects of climate change. In Africa, women do 80 percent of the farming, though they own just 2 percent of the land. She recalled visiting Somalia in October 1992, when warlords were preventing food from getting to feeding stations. Still, it was the end of the dry season, and the people could be confident the rains would come. No more. The Horn of Africa has had its eight hottest years in a row; the U.N. declared famine after at least 28,000 children had died, and on a recent visit to Somalia, Robinson realized the situation is much worse than it was 20 years ago. The panel at the Wilson Center was an opportunity for women who have made it, and for an audience of women mainly on their way up the career ladder, to share their stories. Finland’s president told of her first state visit to neighboring Sweden, and “a women’s magazine said I had too big a pocketbook.” Robinson told of calling for family planning reform in 1971 and how she was denounced from pulpits in the heavily Roman Catholic country. She was 25 years old and had just been elected to the Irish Senate. Her soon-to-be husband burned all the hate mail she got, an act she now regrets, saying it belongs in an archive of those times. 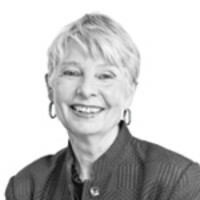 Jane Harman, former member of Congress and now president of the Wilson Center in Washington (who also sits on the board of directors of The Newsweek Daily Beast Co.), used the phrase “force multiplier” to describe the process where women at the top reach out to help a new emerging class of women rise up from the grassroots.